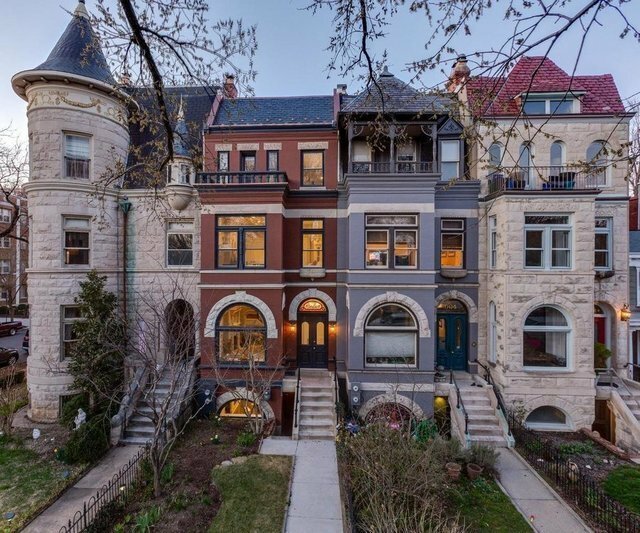 Historic Romanesque Revival mansion originally built in 1896 - restored and renovated in 2018. Unobstructed views of the Capitol and Washington DC from rooftop terrace. Modern, architect designed interior with historical features preserved, this 4,038 square foot home has 5-6 bedrooms and 4 1/2 baths. Large kitchen with custom cabinetry, Caesarstone quartz counters, fully integrated Sub-Zero and Wolf appliances, and lots of daylight from a floor-to-ceiling glass enclosure leading to rear balcony and patio area. Master suite includes walk-in closet and luxurious bath with dual vanities and freestanding soaking tub. Finished lower level with large great room and custom kitchenette. Restored original hardwood flooring and transom windows. One block to Lincoln Park and steps to Barrack's Row, Eastern Market, Eastern Market Metro, the Capitol complex, and the Supreme Court. For more information, visit 902eastcapitol.com.